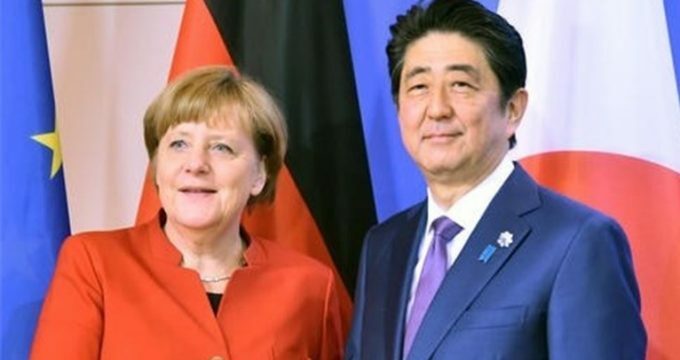 Tasnim – Japanese Prime Minister Shinzo Abe and German Chancellor Angela Merkel said on Monday they both hoped for a prompt and peaceful solution to Venezuela’s leadership crisis, with Merkel saying Germany recognized opposition leader Juan Guaido as the nation’s interim president. Merkel, on a two-day visit to Japan, echoed many European nations in recognizing Guaido as Venezuela’s interim leader and said he should organize new elections as soon as possible. “And we hope that this process is as short as possible and of course peaceful,” she added, Reuters reported. Abe did not comment on Guaido’s status, but he said Japan wanted a stable, democratic and prompt solution to Venezuela’s political crisis. Several European nations have joined the United States in recognizing Guiado as interim president, intensifying a global showdown over Nicolas Maduro’s socialist rule. Abe has emphasized his cooperation with Merkel during a visit aimed a forging an “alliance of multilateralists” to resist US President Donald Trump’s “America First” approach to trade and China’s pursuit of narrow national interests. International issues dominated the news conference. Merkel said Germany would do everything possible to avoid a no-deal Brexit, but she did not want to reopen the Brexit withdrawal agreement.